This green rubber is used for conveyor skirts. Its low coefficient of friction when in contact with other types of rubber makes it more durable and increases belt cover wear life. Available in 12 and 20 mm thicknesses. This orange rubber is also used for conveyor skirts. It is specially designed for sealant materials. Available in 12 and 20-mm thicknesses. This natural rubber (35 Duro A) is used in situations calling for exceptional abrasion resistance. It is ideal for the following applications: cyclones, drain pipes, fans, sandblasting chambers. It has a CN bonding layer for optimal adhesive quality requiring less bonding material. Available in a variety of thicknesses. 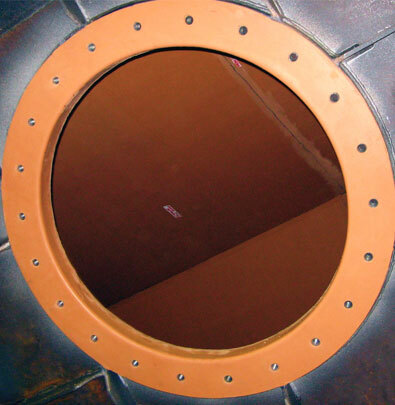 This orange rubber (40 Duro A) provides strong resistance against abrasion caused by chemicals and dry material. Its hardness and non-marking surface make it the perfect lining for pulleys and return rollers. It has a CN bonding layer for optimal adhesive quality requiring less bonding material. Available in a variety of thicknesses. These two black rubber composites (60 Duro A) have exceptional impact and dry wear resistance. They are highly effective for protecting surfaces exposed to sharp-edged and irregular material. They have a CN bonding layer for optimal adhesive quality requiring less bonding material. Available in a variety of thicknesses. 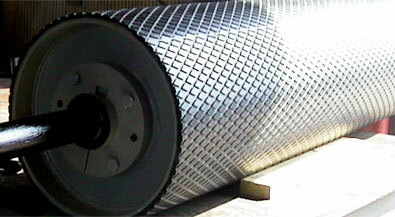 These anti-slip linings are specially designed for drive pulleys. Their diamond-shaped grooved rubber lagging also helps reduce or eliminate problems due to slippage on a conveyor. They have a CN bonding layer for optimal adhesive quality requiring less bonding material. Available in a variety of thicknesses. Anti-slip lagging made of ceramic tiles with small diamond pattern molded in an anti-abrasion rubber, the CK-X offers an exceptional traction. It is specially suitable for wet and muddy application. It has an Increased self cleaning effect due to the grooves between the rows of ceramic tiles and is more flexible than traditional ceramic lagging, so small diameter pulleys can be lagged. Commonly called “black-green-black” rubber, Remaclean is made of two hard outer layers around a soft core for intensive, effective cleaning. Its service life is much longer than that of standard scraper rubber. Available in 20, 25 and 50-mm thicknesses. For more information on these and other Tip Top products, please contact our specialists.